If you follow me regularly, you know I love to add applique to my quilts. Either needle-turn hand applique or wool applique. I love what it adds to my traditional designs! I thought I’d share some of my favorite tools I use for applique and some tips for today’s blog installment. First up is the Sewline Fabric Pencil. 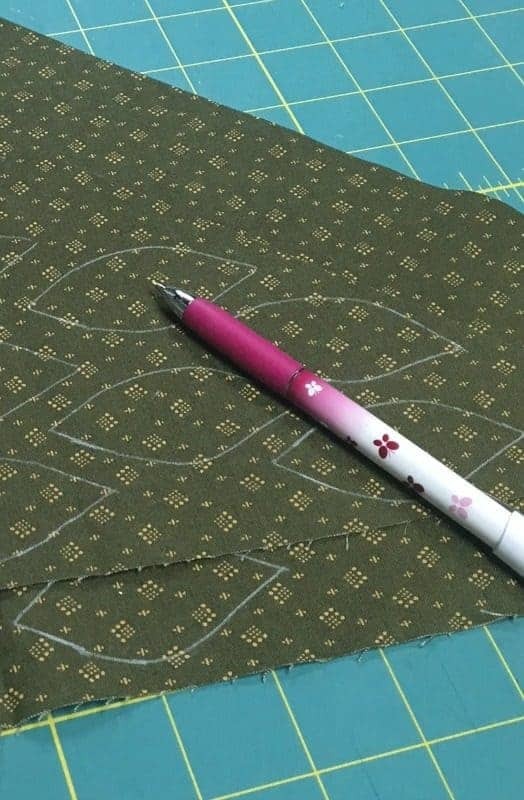 I use this pencil to trace around templates for needle-turn hand applique with fabric. It’s a mechanical pencil, except the “lead” is chalk. It comes in white, pink, yellow and green so the lines will show on any color fabric. I mainly use white on darker fabrics and green on lighter fabrics. It’s erasable and the lines are very fine so the shape you trace from the template is true to size. Next, To anchor the applique shapes to the background, I use one of my favorite things to ever come into the quilting world…. Roxanne’s Glue Baste-it! For years before this glue was available, I would always stick myself with the pins used to hold my applique shapes in place. Not anymore! All that’s needed are small dots of glue to hold the piece in place. And it’s water soluble! 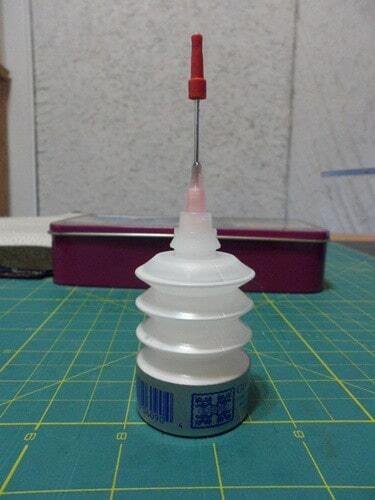 Next up is the needle. 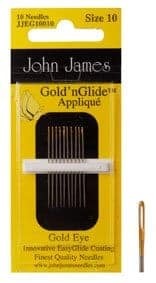 I like to use John James Golden Glide applique needles in size 9. You can experiment and choose the size that fits you. This needle glides nicely through fabric, including batiks! 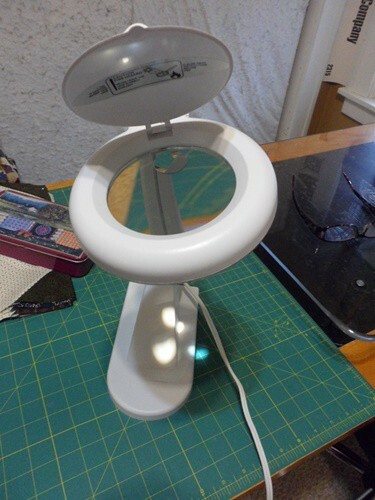 Make sure to change your needle after completing a project. Needles bend and get dull after a lot of use. On to the thread. 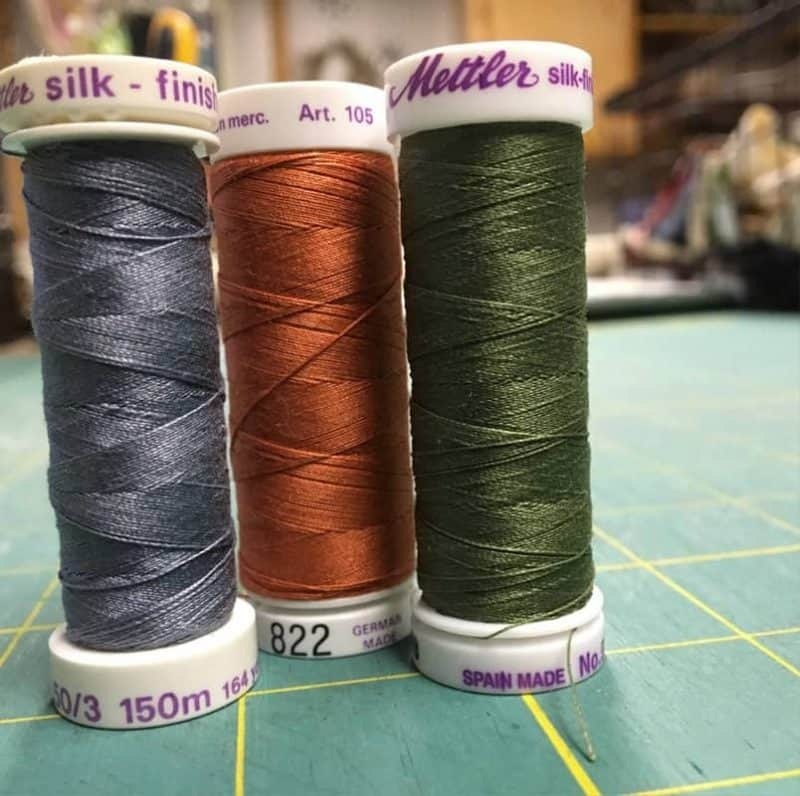 I like to use 50 wt silk-finish 100% cotton threads by Mettler. These threads come in a great variety of colors. I like to match the color of thread to the color of the applique piece I am stitching. If you don’t want to buy a lot of different color threads, you can use an array of neutrals from light tan to dark brown or black. Use the shade that blends the best with the applique color. First up is my favorite fusible web: Heat n’ Bond Lite. I trace my shapes onto the paper side of the fusible and then fuse it to the wool I’ve chosen for each shape. Then I follow the manufacturer’s instructions to fuse the shapes to the background of the project. I will keep my bottle of Roxanne’s glue handy while I’m stitching in case an applique piece lifts off the background a bit. Next up are the threads I use for the stitching. I like Valdani Perle Cotton size 8. You can use colors that match your wool applique shapes so it blends in, or you can use a neutral thread for the whole project. If you are new to wool applique, I have two stitching tutorials here and here. 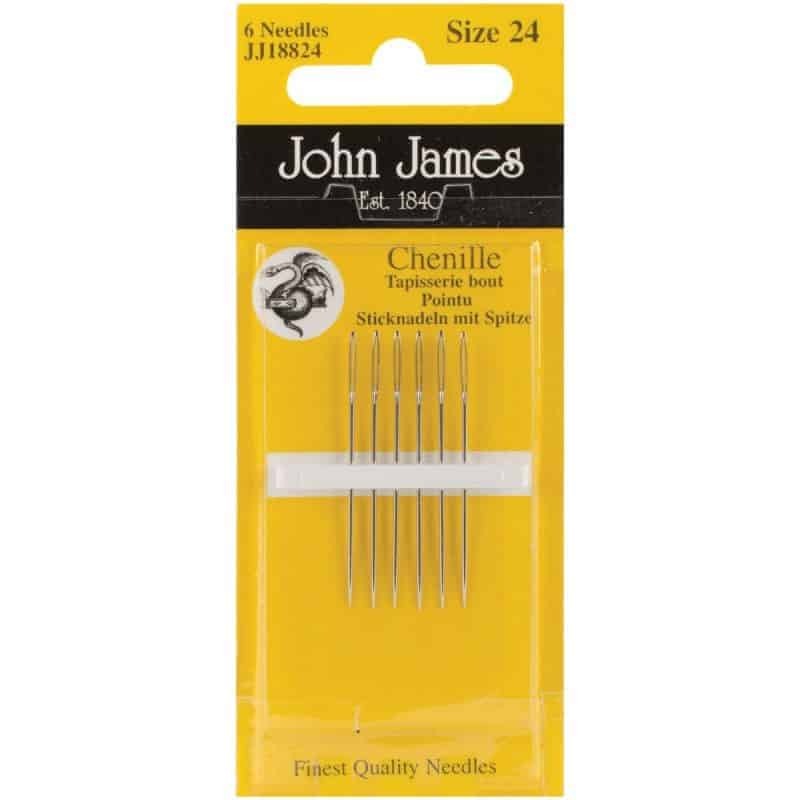 My favorite needles are John James Chenille needles size 22 or 24. I use chenille needles because the eye is wider to easily thread the perle cotton. Size 24 needles are a little shorter than the size 22, so you can choose the needle that works best for you. 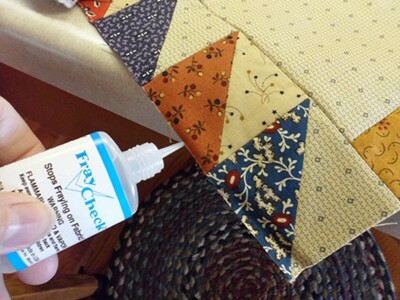 I have a little trick I use to prevent my background from fraying while I stitch… I treat the edges of my project with Fray Check! 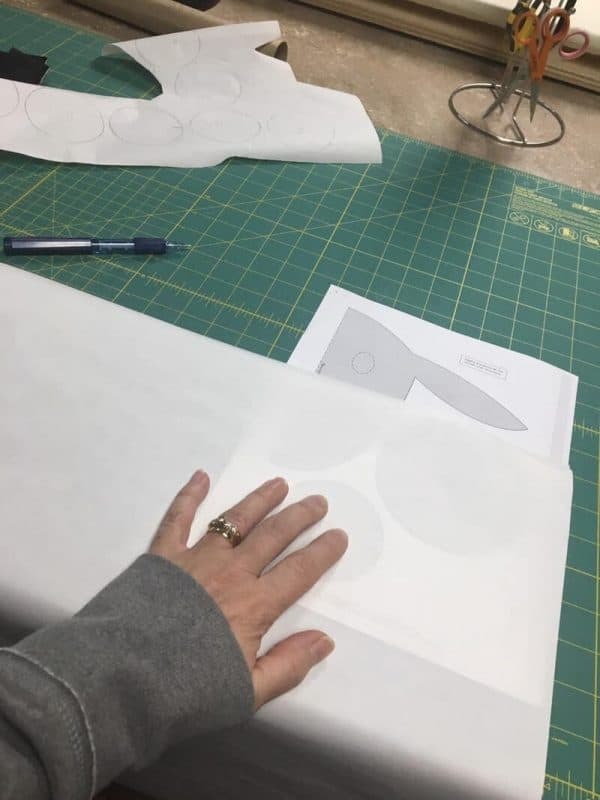 Since you will handle the project you are working on quite a bit while stitching, doing this will keep it from fraying which causes you to lose fabric from the seam allowance. So there you go…. 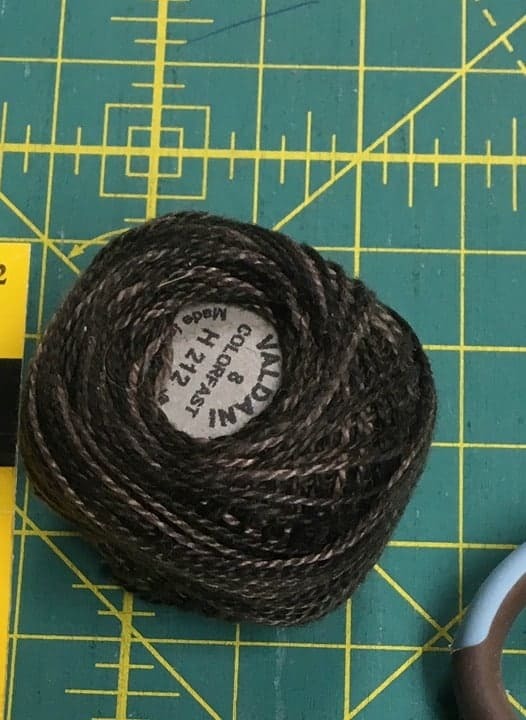 some of my favorite stitching tools with a few tips thrown in.